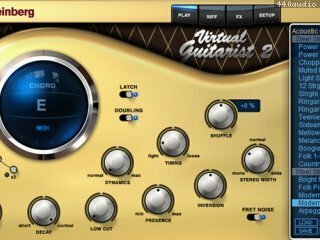 Virtual guitarist is a perfect rhythm guitarist who plays both acoustic and electric guitar, including all keys and difficult chords. A guitarist who never gets impatient, follows the tempo of your song, sounds better, always plays 100% tight, is always completely in tune and who doesn't need to set up his equipment or be miked up, and integrates perfectly into your VST system. 32 brand new styles plus 56 classics from Virtual Guitarist and "Electric Edition" to suit any present musical style. The new styles have been played by internationally renowned musicians. 6.8 GB of high-end guitar recordings, including all the styles of Virtual Guitarist 1 and the "Electric Edition"
The new Part Editor allows in-deep editing of any Part of all Virtual Guitarist 2 Styles - now you can move, delete, mute and transpose each slice of a Part! GrooveMatch technology allows for adapting all guitar lines to any existing groove. Three Amp models, four speaker models with selection of mic type and position, guitar specific EQ. 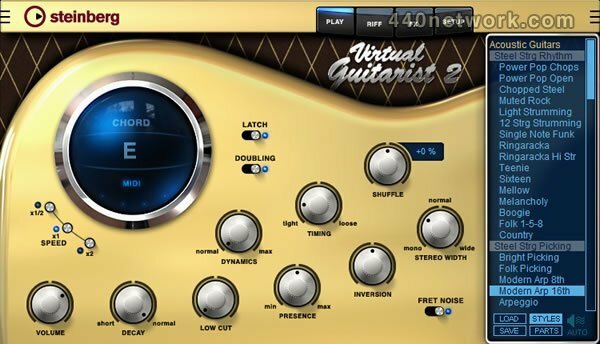 Virtual Guitarist 2 includes are a range of classic guitar effects such as Wah, Compressor, Fuzz, Tremolo, Chorus, Flanger, Phaser, Reverb and Delay. MIDI Learn is now supported for most editing knobs. Virtual Guitarist 2 now supports all major formats: VST, DXi, AU + Rewire for easy Pro Tools® Integration. Standalone version with multiple-out support included.